Mary Ann O'Neill Major (1845-1936) married William James Major (1836-1905) in 1865 in St. Mary's Church, Bellaghy, Magherafelt, County Derry, Ireland, connecting the Majors and the famous O'Neill clan and The Legend of the Red Hand (below). Mary Ann was the daughter of William O'Neill and Katherine McErfane. Soon after their marriage, William and Mary Ann Major emigrated to the United States and settled in Skaneateles Falls, NY. Nearby were William's younger brother, Charles Major, and Mary Ann's older brother, James O'Neill, who lived in an area known as Skaneateles Junction (but often referred to as Hart Lot). Another of her brothers, Anthony, would emigrate to the Skaneateles area, settling in the nearby city of Auburn, in Cayuga County. Information about James O'Neill was provided by Will Hier, who lives a few miles east of Skaneateles on Otisco Lake with his wife, Maureen Elizabeth O'Neill Hier. 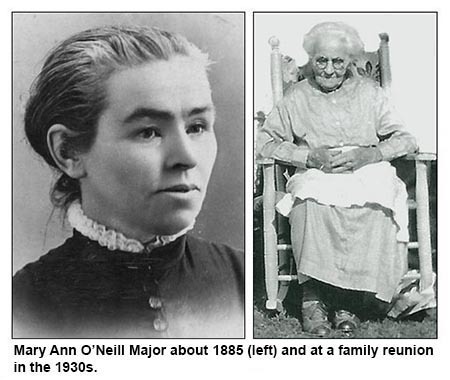 What follows is an O'Neill family tree that excludes the descendants of Mary Ann O'Neill Major. That list is only a click away. Most of this family tree is based on information given me by Will Hier. I've added a few names that I found in a 1948 newspaper obituary for Katherine O'Neill Heverin (whose married name aroused my curiosity because Sarah Major of Skaneateles Falls, born a year after Katherine, also married a Heverin). 1. James O'Neill (1842-1928) m. Anne O'Toole (1852-1917). The wedding took place in Skaneateles, NY, in 1878. Anne O'Toole was born in County Carlow, Ireland. James and Anne O'Neill lived in Skaneateles Junction (Hart Lot) and owned the J. O'Neill Hotel. His obituary in the Syracuse Journal (February 24, 1928) doesn't mention the hotel, but says he was a veteran employee of the New York Central Railroad. It also says his survivors include a brother named Arthur O'Neill of Auburn, which I believe is a mistake; his name was Anthony. Most interesting, there's a mention he was survived by a sister, Miss Sarah O'Neill. This shows up again in the obituary for his sister, Mrs. Mary Major (below), though I can find no other reference to Sarah O'Neill. 3. John Patrick O'Neill (1883-1960) m. Bridget Murray in Skaneateles Falls, NY. in 1907. Bridget and John O'Neill had four children (below). According to the obituary for his sister, Anna, John P. O'Neill was living in Syracuse in 1951. William O'Neill m. Dixie ? Janice Cerio m. Chris ?? Michael Cerio m. April ?? 4. William James O'Neill (1884-1968) According to the obituary, below, for his sister, Anne, he lived in Randolph, Minnesota, in 1951. Mrs. Anna O’Neill Powers of Hart Lot died in Syracuse on Saturday, Sept. 8, 1951. A native and life resident of Hart Lot, she was a retired school teacher and had taught at Hart Lot grade school and Elbridge High School. The daughter of the late James and Anna O’Toole O’Neill, she was a communicant of St. Bridget’s Church, Skaneateles Falls, and a member of the Altar and Rosary Society. Surviving besides her husband, John L. Powers, are two brothers, John P. O’Neill of Syracuse and William J. O’Neill of Randolph, Minn., and several nieces and nephews. Six grandsons of Mrs. Mary A. Major, the oldest resident of Skaneateles Falls acted a bearers at her funeral which was conducted last Friday morning at her home and later from St. Mary’s of the Lake Church. Mrs. Major had been ill for a long time. She died last Wednesday morning, November 27, 1935 at her home. Surviving are two sons, John Major of Solvay and Patrick Major of Skaneateles Falls; two daughters, Sadie and Elizabeth Major of Skaneateles Falls; one brother, Anthony O’Neill of Auburn; one sister, Miss Sarah O’Neill of Rochester, and several nieces and nephews and several grandchildren. The six grandsons who acted as bearers were Robert Major, Vincent Dougherty, Donald Major, William Major, Stanley Major and William Dougherty. 5. Anthony O'Neill (1857-1943) m. Mary Madden (1859-1938). Mary and Anthony O'Neill were married in Auburn, NY, and lived there the rest of their lives. The strangest victory in all history! The RED HAND OF ULSTER is still the province's coat of arms 2,968 years later! That makes for an interesting tale, but is there any truth to it? No, say historians. 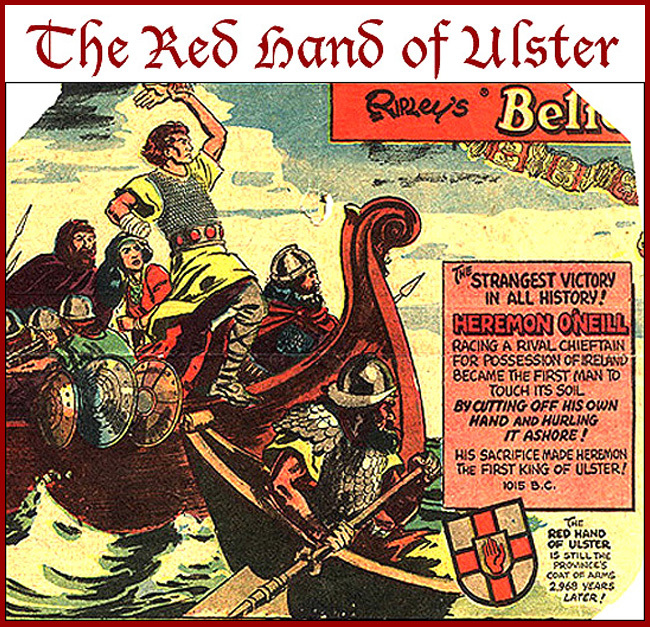 More likely the Red Hand of Ulster has its origins in a Biblical reference to the right hand being symbolic of God's power and authority. Interestingly, the Ripley cartoon shows Heremon O'Neil throwing his right hand ashore, though the legend usually says O'Neill cut off his left hand. Ripley's version fits the coat of arms that displays a right hand. We prefer the bloody hand legend. Maybe Hollywood will turn it into a movie, undoubtedly starring Johnny Depp (who'll insist on really cutting off his right hand).